My Core is Weak... Or Is It? My core is weak. It always has been. Or at least, that is what I tell myself. Not only have I believed that my core is weak, but I’ve allowed this version of reality become my excuse for a long list of things that I cannot do. I cannot take flight in an inversion on my yoga mat because my core is weak. I cannot pop up effortlessly on a surfboard because my core is weak. I cannot rock climb at the climbing wall with my daughter because my core is weak. A strong core provides a rock-solid foundation for just about everything we do. And I’ve used this perception to sabotage my own efforts as a yogini – in my own practice and in my evolution as a yoga teacher – to grow stronger and rise higher. Fine...so if my core needs to be strengthened – just do it. Stop planning and start setting things on fire. Could it really be that easy? Easy or not, it took a bit more for me to see the AHA that I’d been missing. I was sitting in the same rocking chair that I used to rock my then infant baby (aka – the beginning of my “weak core era”), writing in my journal when I realized – what if my core was actually a metaphor for truly embracing what is in my heart and soul? What if I needed to spark the fire that burns inside me – with more passion, more exuberance and more ME? What if I could strengthen my physical foundation by strengthening what was on the inside first? And then...are you ready...because this one is BIG. What if I am already strong? What if my core is just waiting for me to get out of my own way? And what if my shine is already radiant – and I just needed to fire up my trust of what has always been there? But wait..didn’t I already set those intentions? Oh yes. Thanks for the reminder. Oops. At the start of 2017, I asked myself how I wanted to feel this year. I spent days crafting heartfelt intentions – which as it turns out, really are on point for my own awareness. Three months later, I write these intentions EVERY SINGLE Day. Multiple times. I now realize that these intentions are even more powerful reminders of what I REALLY need to focus on. Because although I’ve talked the talk, I have not walked the walk to embrace what is inside and around me. I have not trusted the reflection completely. I’ve overshadowed my sense of abundance by a layer of scarcity that grows like creeping weeds in a garden. I can continue to believe that my core is weak. That my shine is not strong enough yet. Or, I can believe that my core is already strong. That I already radiate a vibrant shine. Believing that my core is already strong and embracing my shine does not mean that I don’t keep working. It just means that I choose to value what already exists deep inside my energetic core – and embrace it with abundance and exuberance so that it shines EVEN brighter. It means noticing what is going RIGHT instead of what is going wrong. And... the more you notice abundance and exuberance, the more you find along the way. Will I fly into an inversion just because I trust my core? No. Or rather, not at first. But I will get closer. And then one day, I'll fly. I'll see that the strength I needed was always there. I just needed to get comfortable in the discomfort. Accept that progress is slow and let go of my attachment to outcomes. 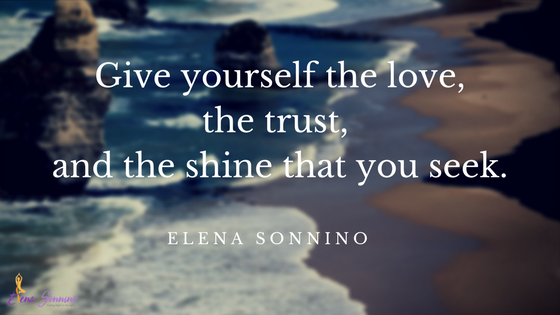 Give yourself the love, the trust, the shine that you seek. Listen to the feelings and gifts that have always lived in your heart. The rest is just a choice that we get to make EVERY SINGLE DAY, over and over again. I don’t know about you, but I choose to embrace, trust and radiate the strength and shine that is ME. Oh...and in case you doubt what the power of energy, intention and staying true to yourself...I'll share that when I first started writing this blog post, the lyrics of Give Love by MC Yogi oozed out of the speaker in office. As if i needed a theme song to give myself permission to share. And then, when I came back to finishing after walking my puppy – Listen to Your Heart by DHT played. I choose to see these synchronicities as “Have I made my point yet?” reminders from the universe. -------- Are you wondering what type of life coach I am if these are the thoughts that I STILL have each day? Go ahead. Wonder. Or find out with a FREE 30-minute discovery call. Because guess what? I am a life coach that values showing up as my true self – every single day. And that requires honesty, acceptance and a whole lot of gratitude. I’d love for you to join me! Do You Allow Yourself to Play Every Day?